Angie Stone, Mica Paris, Omar, Tony Momrelle, Navasha Daya, Anthony David, LaSharVu and Sharlene Hector breathing fresh and irresistible life into seminal grooves by Maze, Evelyn ‘Champagne’ King and Teena Marie among others. musicianship, beating soulful heart. Angie Stone provides sass ‘n’ slink over signature low-end synths for a suitably raw retooling of Yarbrough & People’s 1980 hit Don’t Stop The Music, whilst the funky strut of Thinking About Your Love (a crisper, more urgent update of Skipworth & Turner) perfectly complements Omar’s expansive, one-in-a-million vocals. Elsewhere, Reel People regular Tony Momrelle revisits Carl Anderson’s mid-Eighties gem Buttercup (penned by Stevie Wonder) with considerable finesse as well as Bill Withers’ seriously underrated collabo with guitarist Jose Feliciano, Can We Pretend. Basement Jaxx songstress Sharlene Hector uplifts on a sparkling new version of Side Effect’s Always There . Reel People’s sweet summer hook-ups with Baltimore chanteuse Navasha Daya are also present and correct – I’m In Love and Can’t Fake The Feeling pay affectionate tribute to Evelyn‘Champagne’ King and Geraldine Hunt respectively at the same time as showcasing Daya’s sublime, jazz-flecked delivery. There’s still room for Anthony David’s luscious rendition of deep-soul bomb Keep It Up (originally by Milton Wright) and for LaSharVu – a white-hot amalgam of Hector and fellow female powerhouses Vulu Malinga and LaDonna Harley-Peters – to smartly re-dress Teena Marie joint I Need Your Lovin’ . Sleek instrumental twists on Maze’s Twilight and Pleasure’s Joyous complete the incredible line-up. 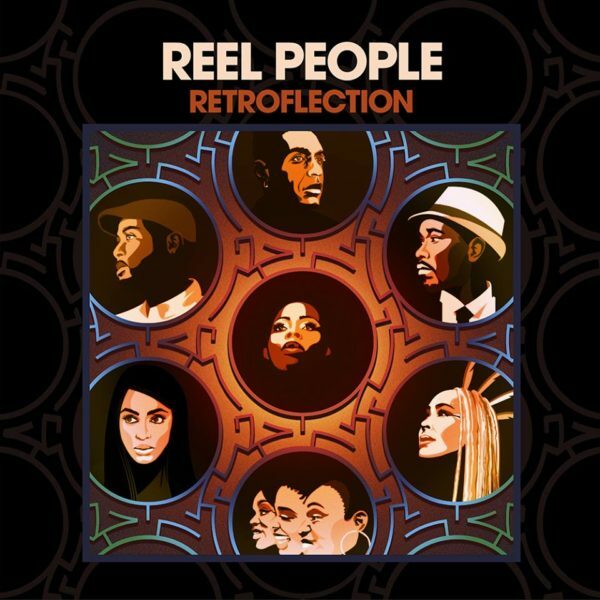 Reel People’s first full studio album in 10 years (following acclaimed releases Second Guess and Seven Ways To Wonder , as well as compilation work including Golden Lady), Retroflection reflects the highest possible level of passion and polish. Such soulful devotion and craftmanship has ever been a Reel People hallmark. Recorded in London and Atlanta over an intense 12-month period, Retroflection also avoids the formulaic overload of modern beats and basslines that countless others pursue. Here the past is artfully reawakened, Reel People’s talented cast of performers re-treading classic riffs with new yet respectful purpose. Their compelling neo-soul blend of now and then should awe diehards and newcomers alike. Retroflection is one hell of a return. Oh, and before you ask – (it’s the question Lazarus gets the most) – live shows are set to follow. Reel People have recorded Retroflection with an easy translation to ‘the road’ front of funky mind. Looks, then, like we’ll be enjoying this incredible group’s company well into 2019…and beyond. It really is good to have them back.